A group of Movable Type specialists – some of them former Six Apart employees – wanted to speed up the development of the open source version of the popular publishing platform and decided to group together in a quest to build an independent, community-driven CMS for bloggers and other publishers. The platform is dubbed Melody and will be managed by a non-profit named The Open Melody Software Group, which has Anil Dash (Six Apart’s outspoken VP and Chief Evangelist) on its board. From what we can gather reading about the project on the website, its founders are passionate about Movable Type but see more value in forking it, community-style, “to see it flourish as a platform”. According to the FAQ section, the team is working together with Six Apart to some degree – which isn’t surprising considering Dash’ presence on the board – and strives for as much compatibility with Movable Type’s core APIs as possible. However, you can also read that the team is inspired by successful open source initiatives such as WordPress (a Six Apart rival), Apache, Linux and Firefox. As for the product, it’s not ready yet, even for beta testing. 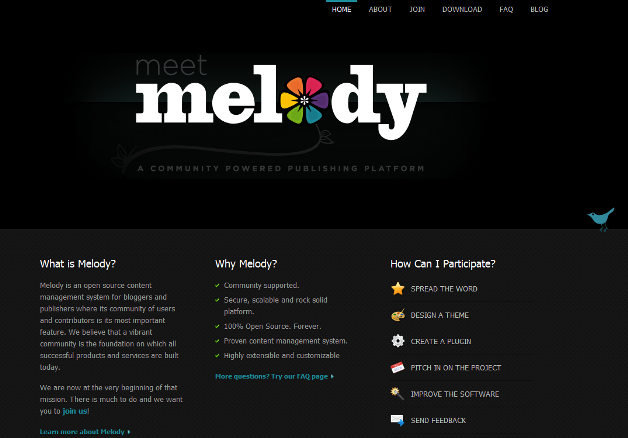 The first release (Melody 1.0) is scheduled for ‘Fall 2009’, but if you’re a developer and you can’t hold your horses than you should check out the latest development snapshot from Melody’s source code repository on Github. Behind Melody: Tim Appnel, Jesse Gardner, Dan Wolfgang, Mark Stosberg, Jay Allen, Su, Arvind Satyanarayn and Byrne Reese.